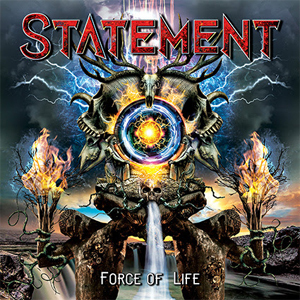 STATEMENT, one of the most hard-working bands in Denmark, release their third opus, Force Of Life, on March 1st on Mighty Music. The record was produced and mixed by Soren Andersen (Mike Tramp, Glenn Hughes) and features 10 songs of melodic rock/metal for fans of DISTURBED, METALLICA & PRETTY MAIDS. Artwork was done by Jobert Mello/Sledge Hammer (SABATON, PRIMAL FEAR). STATEMENT recently returned home after a European tour with British metal legends DIAMOND HEAD. “This tour was the first real tour for us and we met new friends and had a good spirit between all four bands. DIAMOND HEAD (UK) was the Headliner act, and GIN ANNIE (UK), STATEMENT (DK) and BLINDING SPARKS (F) were the three support bands on the tour. We have been playing a lot of shows in these last 5 years but never so many in a row, but we are sure that this tour was just the beginning and one out of many more. Tour life is focus on only one thing, and that’s your performance and that is what we are there for”, says Niels Alex (lead guitars, vocals). Check out the first video for "I Wonder Why" on KNAC.COM HERE. The first two albums were recorded and mixed by Tue Madsen/Antfarm Studios (SICK OF IT ALL, MOONSPELL) The new album Force Of Life has been produced and recorded by Soren Andersen at Medley Studio (Glenn Hughes/Mike Tramp/ARTILLERY). Force of Life was recorded in Medley Studio in two sessions. The first session was tough and a “feel kinda thing” to see if we should continue the new work with Soren Andersen behind the desk. We quickly found out that our minds melted into one, and it totally changed the sound of STATEMENT to something we never expected”, adds vocalist Jannick Brochdorf. Niels Alex concludes: “On the DIAMOND HEAD tour we found ourselves some very good friends in GIN ANNIE from the UK. They have an album recorded and are doing a release tour in the UK and STATEMENT is invited to play all the shows together with them. We are looking forward to play in UK – it’ll be the first time for us! We’ll be playing 10 shows and we are looking forward to meeting the British audience”.